If you are looking for a truly rich, luxurious moisturizing creme for extremely dry skin, this is the one for you. 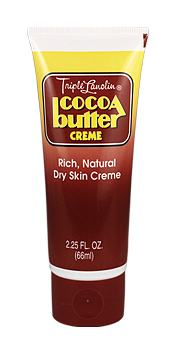 Triple Lanolin Cocoa Butter Creme contains a unique blend of the highest quality coca butter and lanolin. These two ingredients help to soften and soothe even the driest skin problems. Our high quality, cosmetic grade of coca butter will not leave you smelling like a chocolate bar either. Our creme is very effective in dealing with dry, ashy-looking skin. Many women also use this during pregnancy to reduce or eliminate the occurrence of stretch marks on their abdomen. 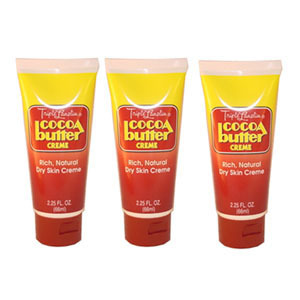 Triple Lanolin Cocoa Butter Creme is also a wonderful after-sun skin moisturizer to help relieve the dryness caused by prolonged exposure to sun and wind.